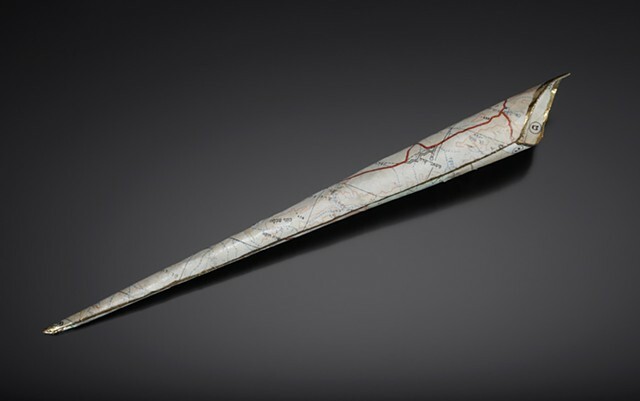 This Torah pointer is made out of a Jewish Atlas of Israel from the early 1950's, shortly after Israel was declared a country. As in my earlier wheel/perambulator Torah pointer, this Torah pointer can be interpreted as a metaphorical connection to the Jewish people's early forced nomadic life. It can also be a metaphor, referencing the Torah as a map, meant to help you find your way. This pointer can also be call attention to the use of the Torah in the current territory disputes in Israel. This work was made possible in part by a Fellowship from the Boise State University Arts and Humanities Institute.